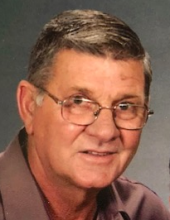 Franklin Bankston Dickson, 73, of Moss Point, passed away on Saturday, January 12, 2019 in Mobile, Alabama. Franklin was born on January 19, 1945 to the late Sidney Franklin and Virilla Clara Dickson in Purvis, Mississippi. He was a veteran of the United States Navy, where he was stationed on the U.S.S. Forestal and the U.S.S. Kitty Hawk during the Vietnam Era. He was employed by Mississippi Power for 36 years, where he retired as an Operations Team Leader. He loved attending church with his family, golfing, watching western movies, and Saints football.Most of all, Franklin loved spending time with his family. He enjoyed planting a garden with his grandchildren, especially growing watermelons. Along with his parents, Franklin was preceded in death by his sisters, Wanda Fay Fortner and Lois Mae Dobson, and his brother, Troy Laverne Dickson. Left to cherish his memory is his loving wife of 53 years, Myra Jean Dickson; children, Jeffrey Franklin (Paula) Dickson, Gina L. (Dwight) Matthews, and Anna M. (Joshua) Pierce; four grandchildren, Derek W. Kirkwood, Miranda E. Dickson, Carson C. Pierce, and Austin T. Pierce; two great-grandchildren, Noah W. Kirkwood and Liam G. Kirkwood; one grandchild on the way; and another great-grandchild on the way. He is also mourned by numerous relatives and friends. The visitation for Franklin will be held on Tuesday, January 15, 2019 from 2:00 p.m. until 3:00 p.m. at Heritage Funeral Home in Moss Point, MS. Funeral service will begin at 3:00 p.m. in the funeral home chapel with Bro. Jimbo Reed officiating. Interment will immediately follow at Serene Memorial Gardens. To send flowers or a remembrance gift to the family of Franklin Bankston Dickson, please visit our Tribute Store. "Email Address" would like to share the life celebration of Franklin Bankston Dickson. Click on the "link" to go to share a favorite memory or leave a condolence message for the family.